Episode 93 What is a Herald? Who or What is Calling You into the Great Adventures of Your Life? Episode 93 What is a Herald? Who or What is Calling You into the Great Adventures of Your Life? Joseph Campbell, in his book The Hero of a Thousand Faces, posited that the most popular stories over millennia and across cultures, share a specific formula– the heroes journey. You have consumed this “monomyth” in pop culture classics like Star Wars, the Matrix, Harry Potter, Lord of the Rings, to name only a few. The Hero’s Journey has a specific plot structure, but it also has a repeating cast of characters, known as character archetypes. Archetypes tell us the role a character plays in the story. Thinking about the characters in your story – or the people in your story as these pivotal characters adds a bit of a perspective shift that often provides clarity in your story, but most of all, when you look closely the archetypes of story provide the handbook for life, an instruction manual on the art of human stories and creating and recognizing your own hero’s journey. If nothing else it’s very interesting to consider the things that challenge you as threshold guardians, the people in your life who invite you into adventure and new ways as heralds, and the villains we face as shadows of our own possible dark side. The central archetypal cast of the Heroes Journey fall into one of these eight character roles: Hero, Mentor, Ally, Herald, Trickster, Threshold Guardian, Shape Shifter, Villain or Shadow. Today I want to talk about the Herald. Why do we care who the heralds are in our stories? I don’t know, maybe you don’t, but the reason I do is because they are key players in the directions we head in our lives. They may be in the script for a very short moment, but the role they play is incredibly significant, and that merits at least a 15-minute conversation. And, personally, once I have identified the heralds in my own story they take on a pedestal place in my book because they are the catalysts, the instigators for my greatest pivotal events. They opened the doors to adventure. Life is one big journey, and within it we take lots of different kinds of journeys – we take emotional journeys, we take learning journeys, we take professional journeys and journey through relationships. We take literal journeys filled with travel and adventure, and the heralds who extend those invitations, who show me the door, well, they have a special place in my heart. The great stories begin with the “call to adventure.” The human spirit is born to explore and grow, and change is happening to us all the time, but often it is our choice as to whether or not we accept the invitation. We have to act when the Herald shows up. Let’s talk about some heralds we are all familiar with from pop-culture: R2D2 brought the message of Princess Leah that started Luke on the journey of his life. 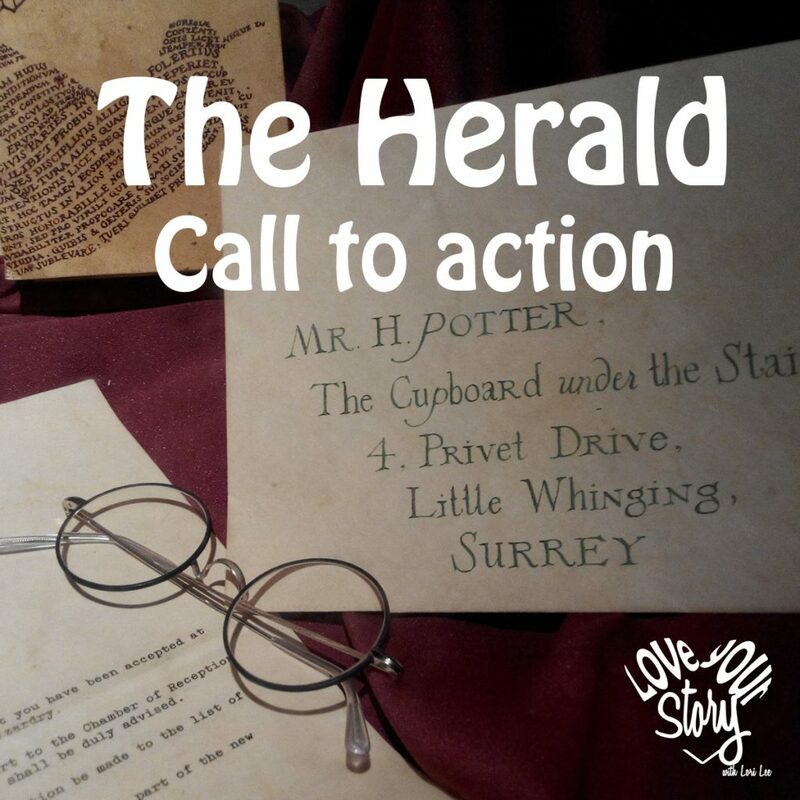 The letter announcing the ball in the Cinderella story opened a door to magic and happily ever after – yes a herald can be a letter calling you into the adventure. In the Hobbit, Gandolf invites Bilbo out onto the adventure from which he may not return alive, but in reality, the adventure ends up defining his entire life and legacy. In my own life, my friend Sally suggested I attend and invited me to embark on the emotional intelligence training that was very key to my healing. Very key to the creation of this podcast. My friend Sandy was key in helping me find my way to my embarking on the journey of my masters program, teaching at Utah State, and ultimately adding one of the most important stepping stones into the path of my life. I had a terrifying dream once, I woke in a cold sweat and sat straight up in bed, my back pressed against the headboard, looking out toward the door of my bedroom for hours, all lights on, 911 dialed into my phone and my finger next to the send button. This dream helped me realize how traumatized I was being with my second husband and began my journey to leave. I’d like to point out the obvious, if Cinderella had not decided to accept the invitation and fight to go to the ball, if Bilbo had said “no” to Gandalf, if Luke had ignored the plea of Princess Leah the stories we know would never have taken place, but more importantly to the characters (if they were real), the experiences those characters had would never have happened. Do you see what I’m getting at here? When you don’t say yes to the Herald you don’t have much of a story to tell. We talk all the time about creating your life story on purpose. We talk about choices and believing in self and possibility, we talk about action, but I know far too many people for whom heralds show up with calls to action and opportunity that include leaving the Shire or believing in the magic of faith, or creating a life outside their comfort zone, or embracing passion and love and they simply can’t do it/won’t do it. The fear of failure, the fear that they might make a mistake, the fear of the possibility of regret, the fear of the unknown freezes them into the lives they are already tired of. Have you seen the movie “Yes Man?” In it, Jim Carrey plays a character that promises to say YES to everything anyone asks him to do. It opens up massive opportunities for experiences, for learning, for a relationship. Of course, there is lots of humor, but the takeaway is how saying YES to life, YES to opportunity, YES to the unknown opens doors. While I’m not suggesting we all relinquish our ethical better judgment, I am suggesting that we cannot embark on the adventures of our lives if we ignore our heralds. When the invitation to adventure, or change, or the unknown calls us out, the rest of our life awaits. Will we say no and keep writing the same habitually dictated script, or will we say YES and head out on the yellow brick road, on the fight for the universe, will we go to the ball and see what magic happens? Nobody knows what lies ahead in the future. There is never a guarantee that the adventure you’re being called to will be filled with bliss – in fact, there is pretty much a guarantee that it won’t because that’s the nature of adventure. You still have to fight Darth Vader, you still have to brave the evil stepmother, you still have to fight trolls and dragons and your inner fears, but that’s the friggin story. That’s the story you’ll be telling when like Bilbo, you retell your story at the end of your life. What did you create with your YES and what did you miss with your NO? We’ve had a couple episodes where I spoke with the Kjar family and their choice to heed the call to sell their home, buy a mobile home, and hit all 50 states in 52 weeks with 4 kids in tow (See episode 45 & 61 if you want more on that story). I asked them not long ago if they regretted selling everything and now that it was almost over having to start all over, and the answer was a resounding NO. It was and is an adventure of a lifetime with so many experiences that have built out the beauty of the last year of their lives and the effect it will have on all of them in the years moving forward. They said YES to the adventure, they took the road less traveled, and that has made all the difference. What if I hadn’t accepted Sally’s invitation to go to the emotional intelligence training that helped me heal my story. I wouldn’t be here doing this podcast. I doubt I would have found the healing I needed in the way I needed it. I certainly wouldn’t have experienced it the way I did. That’s a game changer for me. What if I hadn’t dared accept the call to embark on a master’s program that required me as a single mom supporting two sons to drive an hour and a half each way to the university every day, stay up until 3:00 am grading papers on a regular basis – I taught at the university also, doing research and homework constantly, presenting at other universities all while holding down a full-time job? Well, what absolutely seemed impossible became possible with all the magic and hard work that a real adventure takes. You too can embark on your own adventures, but that means you have to accept the invitation when the herald brings it. Is there something inside you that is pushing for change? Is there a friend or opportunity that is offering you a new experience, a new relationship, an adventure? Remember heralds can be letters, invites, dreams, people….watch for your calls to adventure. Take action! When the herald proffers you the invite, consider the possibility, not the fear. Say YES to more than you say NO to. Answer the calls into your own life story. See you next week and your challenge for the week is to think about the heralds in your life. Who were they? What did they offer? Did you choose to accept the call? Where has that answer – whatever it was – landed you? See you next week on the next episode of Love Your Story. May you heed the calls into your best adventures. Share the podcast, leave us a review on iTunes, and go to www.loveyourstorypodcast.com to sign up for a couple important tools to help you create your best story: There is the 21-Day Challenge for living your best life story now; and the 5-Steps to Reframing past stories that hold you back. See you next week.